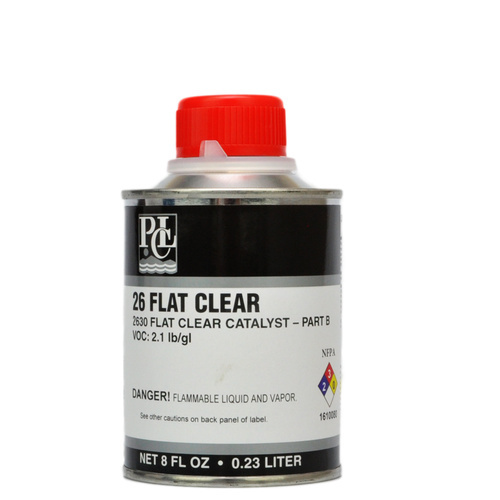 26 FLAT CLEAR is formulated for premium productivity at 2.1 VOC or less. 26 Flat Clear can be applied over a variety of base coats in base coat/clear coat systems. 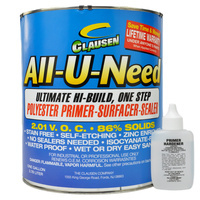 This twocomponent polyurethane system with a 4:1 ratio offers a durable, fast dry finish. This product is user-friendly, resulting in increased production. 26 Flat Clear is VOC-compliant for all multi-stage topcoat systems. MIX ONLY WHEN READY TO SPRAY! Mix ratio is 4 parts 2613 FLAT CLEAR BASE with 1 part 2630 FLAT CLEAR CATALYST. MIX ONLY ENOUGH MATERIAL TO SPRAY TWO (2) WET COATS.